What good news does a new fragment of text bring? Did Jesus Christ have a wife? Doesn’t this constitute a new gospel? These are questions many many are asking and answering now that Karen L. King of Harvard Divinity School has shared publicly a new fragment of text that somebody anonymously shared with her. What I’d like to ask is why the news of Tihonos’ Wife wasn’t as big as this Jesus’ Wife news. Why wasn’t that news at least a little bigger? Is “no news” really “good news” and “new news” really gospel? Why if it hints of “biblical” a “whole fragment” gets so much more attention than if it hints of “classical”? Or, why the hype now? Why not then? [T]he identification of a papyrus in the University of Cologne as part of a roll containing poems of Sappho. This text, recovered from Egyptian mummy cartonnage, is the earliest manuscript of her work so far known. It was copied early in the third century BC, not much more than 300 years after she wrote. So what was new? And so what? What questions remained? And what was really new? And why not more hype, since this confirmed a man had his wife? And this provided much cause for speculation. Was Sappho a lesbian? Why did Plato call her the tenth muse? And who had the wife? 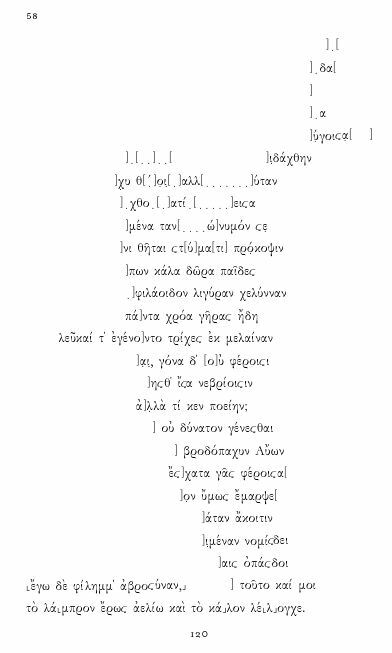 Sappho’s fragments are of two kinds: those preserved on papyrus and those derived from citation in ancient authors. When translating texts read from papyri, I have used a single square bracket to give an impression of missing matter, so that ] or [ indicates destroyed papyrus or the presence of letters not quite legible somewhere in the line. It is not the case that every gap or illegibility is specifically indicated: this would render the page a blizzard of marks and inhibit reading. Brackets are an aesthetic gesture toward the papyrological event rather than an accurate record of it. I have not used brackets in translating passages, phrases or words whose existence depends on citation by ancient authors, since these are intentionally incomplete. I emphasize the distinction between brackets and no brackets because it will affect your reading experience, if you’ll allow it. Brackets are exciting. 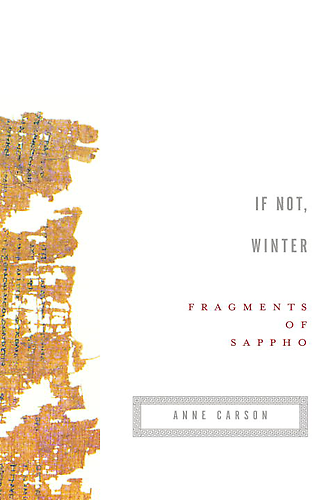 Even though you are approaching Sappho in translation, that is no reason you should miss the drama of trying to read a papyrus torn in half or riddled with holes or smaller than a postage stamp — brackets imply a free space of imaginal adventure. Sappho says that to die is evil: so the gods judge. For they do not die. As acts of deterrence these stories carry their own kind of thrill — at the inside edge where her words go missing, a sort of antipoem that condenses everything you ever wanted her to write — but they cannot be called texts of Sappho’s and so they are not included in this translation. I confess I used to like fragment 58 in its incorrect form. It had fawns wandering through the middle and an uncontainable ending so packed with abstract words it read like Wittgenstein on one of his hooligan days. I made a little book about it once years ago, with paintings of fawns and much analysis of the ending, now obsolete. Funny how time carries things out of sight. The text printed in the TLS by Martin West is not exactly a “new Sappho” but a more nearly complete and more correct version of a text that had been numbered fragment 58 in most editions. By collating the old and new versions of this fragment, scholars are able to say for sure where the poem begins and ends, what almost all the words are, how to understand its metrical form, and how to read its mythical exemplum. 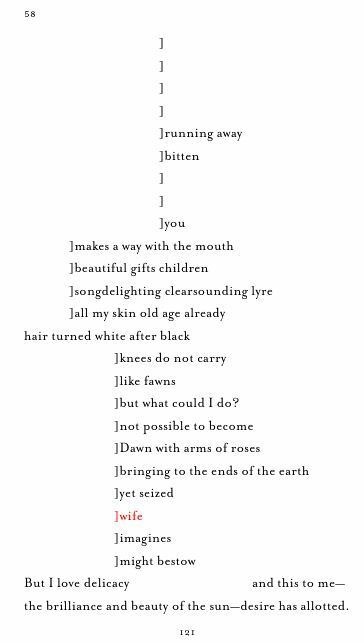 Now the fawns are relegated to a simile and the flash ending belongs to a different poem. It is a quieter composition. 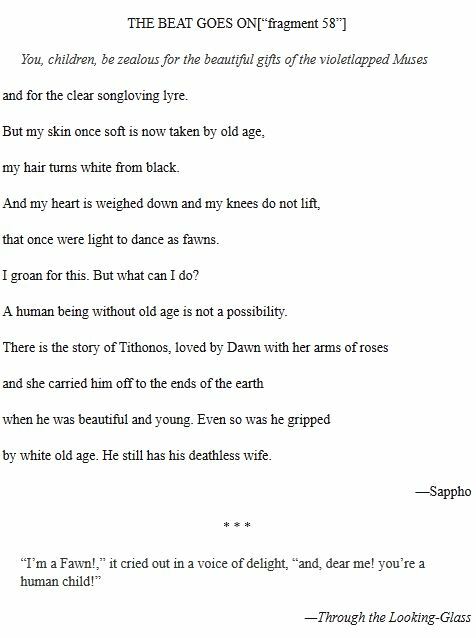 But poetically indisputable in the way that Sappho’s poems are. To me, this is one of the most important lessons of this new old text. That is, Carson let Sappho’s text be Sappho’s text and not more. When more information finally came out about the original text, likely, then the translator still did not invent more than the poet does. And, even though Carson conjectured early on that “scholars are able to say for sure where the poem begins and ends,” the fact is that scholars continue to debate this very point. The fragments, old and new, do not settle all. You have a readable poem here as it stands, but questions and arguments in the halls of Academe will go on for a long time. First there are problems about reconstruction of the text where lines are damaged. Then they may be sub-meanings of what Sappho was trying to say whether in a socially conscious framework, or a Lesbian mode or from a Feminist point of view. But for the literate reader of poetry, the poem is sufficient to stand on its own metrical Feet. It has come through the decay and attrition of a hundred decades and that, beside the wording of this lovely and triste poem itself, is miracle enough. I wonder if biblical scholars and bible bloggers and bible hobbyists and religious Bible types will recall that story of Tithonos, the material of facts of the myth. There may be more truth therein than in whether Jesus Christ, the historical, had a wife from what appears partially penned by someone once upon a time.